BELLINGHAM — Lois Eleanor Byrd, 87, died March 20, 2019 in Bellingham, Wash., where she had resided the past 42 years. She led a long and full life. Lois was born Jan 24, 1932 in Astoria, Oregon. She was the eldest of five children born to Eino and Winifred (Aho) Torppa. She was raised in Naselle, Wash., a small Finnish community in Southwest Washington. Lois loved her Finnish roots and the simple small town life of family, work, and church. She married her high school sweetheart, Lewis Byrd of Menlo, Wash., while he was on furlough from the Army. They were married in December 1950 and enjoyed 61 years of marriage. When Lewis’ work for the Federal Aviation Administration called him to Tanana, Alaska, Lois and her five children under the age of seven moved with him to the remote Indian village. After a year there the family moved to Fairbanks, where Lois made a number of lifelong friends. She was kept busy raising her five daughters in Alaska while battling the long subzero winters and months of darkness. She had a warm spot in her heart for the native people wherever she lived, and had handmade baskets from many of the local tribes. The family then moved to Palmdale, California, where Lois was very active in the First Presbyterian Church, the 4-H Club, and in ensuring her daughters receive an excellent education. In 1976 Lois and Lewis moved to Bellingham, which became their home for 42 years. 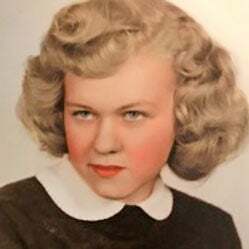 Lois had many and varied interests, including quilting, handcrafts, genealogy, American history, Major League Baseball and college basketball. She was a founding member of the Evergreen Quilters in Whatcom County, Washington, and a member of the Roeder Quilters. Lois operated a craft business “The Byrd House” through which she supplied many shops with her high-quality handcrafted fabric items. She was always involved in her local church, helping to start the Meadowbrook Piecemaker Quilters at Birchwood Presbyterian Church, attending Bible study, and actively participating in the Seasonaires fellowship group. She raised all of her children with a strong Christian foundation. Lois was the family genealogist and had extensive knowledge of her family history in the U.S. and its connection with relatives in Finland. She was 100 percent Finn and very proud of that. She had ‘Sisu’, a strong work ethic, and a moral compass guided by her faith. She is survived by four of her five daughters: Linda Seaton (Michael) of Hanford, California; Laura Byrd of Bellingham; Liisa Lyon and Lucia La Rocca (Frank), both of Oakland, California. She is also survived by her sisters Gloria Keithley of Bures-sur-Yvette, France and Ruth Miller (Torppa) of Ellensburg; and brother Charles Torppa of Longview; plus three grandchildren, Carol Young, Alex Sanchez and Allison Mueller, and 10 great-grandchildren. Lois was preceded in death by her husband Lewis, their eldest daughter Loretta Byrd, and her sister Helen Josephson (Torppa). Funeral service will be held Saturday, April 6, at 11 a.m., at the Community Congregational Church in Naselle. Concluding graveside rites follow at Peaceful Hill Cemetery with a reception at the church. Memorials are encouraged to the Finnish-American Folk Festival (FAFF) P.O. Box 156, Naselle, WA 98638 or to the Peaceful Hill Cemetery Association, PO Box 501, Naselle, Washington 98638. Her guestbook is available at www.penttilaschapel.com. Her casket will be open on Friday, from noon until 6 p.m., at Penttila’s Chapel in Long Beach and Saturday morning, 10 a.m. until 10:45 a.m. at the church.